Dan Hiller. 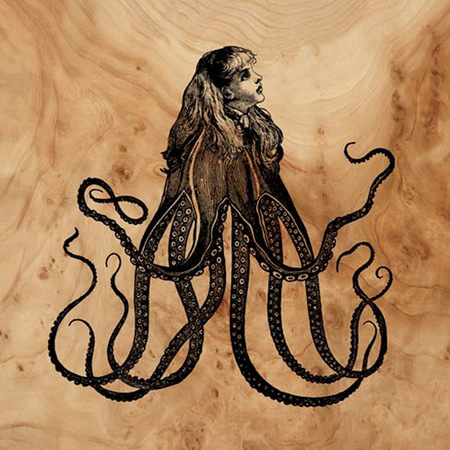 Amazing altered engravings and more. Unfortunately, I can't remember how I came across the magically intricate work of British artist Dan Hiller. I was probably on a late-night cabernet-soaked internet-scouring art quest. I'm just happy I did find him. He creates altered engravings, ink drawings, paintings, and sketches all with incredible precision and other worldly qualities. Familiar, creepy, stunning, and stylish. His work is marvelously odd and surreal. Deer in suits? Sure! Owls in top hats? Of course! Skulls on Victorian patterned paper. Hell yeah! If it works, it works. 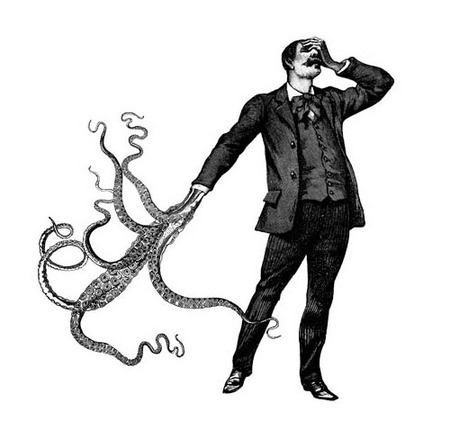 Dan Hiller's blog shows recent pieces and the header is so freaking cool. Hope you all will visit his site, click around, and of course I imagine the artist would be quite happy if you purchased some of his work. 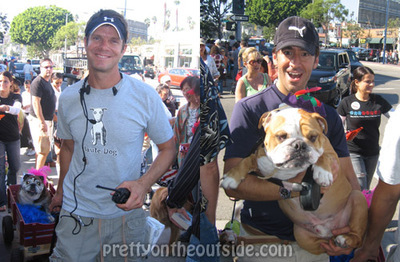 My friend Justin Rudd is the director and founder of the world's largest Halloween pet event. 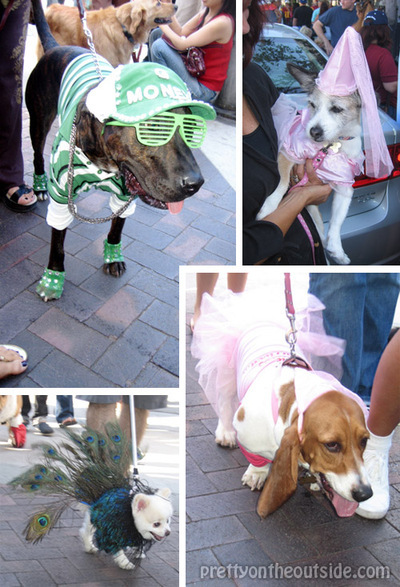 Over 600 costumed dogs and their often costumed owners walk 12 blocks through Long Beach's Belmont Shore. The joyous spirit at this event is immeasurable. Above on the left is my especially handsome friend Justin, and on the right is his equally handsome partner Ralph Millero. Justin leads the parade by pulling their gracefully aging bulldog Rosie, while Ralph carries their text book perfect bulldog Riley. The event raises money for local animal charities and beach cleanups. It also provides an ear to ear grin for those present which lasts the remainder of the day. I still am smiling. My friend Samuel Lippke captures perfectly more of the madness on his blog. He's a professional photographer which is why Samuel's photos are 200% better than the ones I took with my little point and shoot. Check it out! Levi Van Veluw. Amazing Van Ilovehiswork! 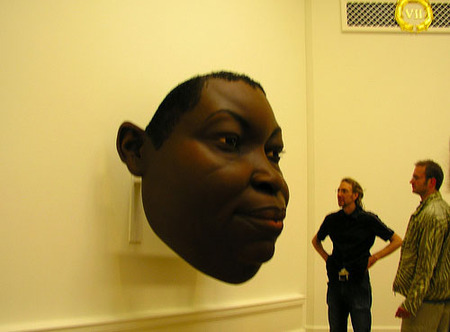 I was clicking around the web this morning and stumbled upon the multidisciplinary work of dutch artist Levi Van Veluw. Please click on that link to see more of his astonishing work. His works constitute elemental transfers; modifying the face as object; combining it with other stylistic elements to create a third visual object of great visual impact. The work you see therefore is not a portrait, but an information-rich image of colour, form, texture, and content. The image contains the history of a short creative process, with the artist shifting between the entities of subject and object. 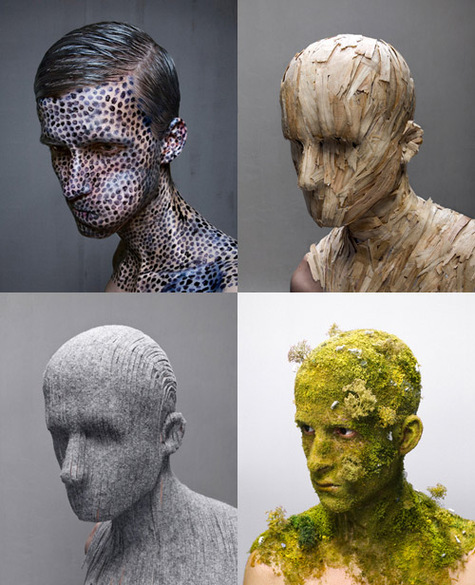 He uses materials such as: carpet, ball-point pens, wood, moss, q-tips, and tape to complete these other worldly photographs. Again, I hope everyone will check out his site to see further pieces. Discovered on pingmag. There's a great interview with Levi on that site. Alan Bennett Ilagan is a free lance writer, photographer, and blogger. 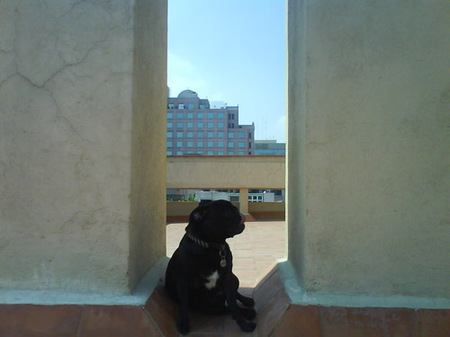 He's gearing up for his first solo exhibition at The Romaine Brooks Gallery. Go Alan go! The opening reception will be held Friday September 5th as part of first Friday Art Walk in Albany, NY. Please follow the below link to see a collage I created using some images from Alan's show as well as a few photos I snatched from his site. 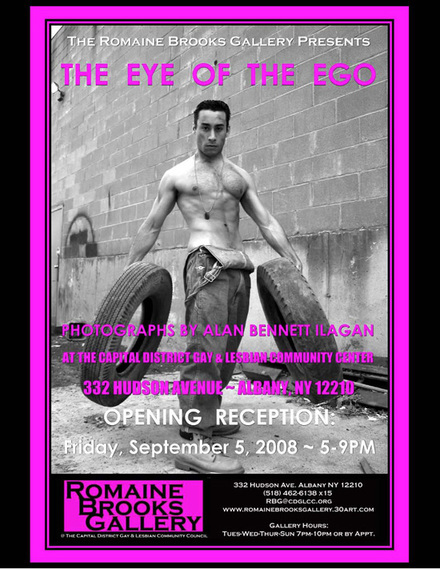 Alan, I hope your show is a huge success and that you'll sell all your photos! Best of luck friend. And I know this is the first of many more exhibits. 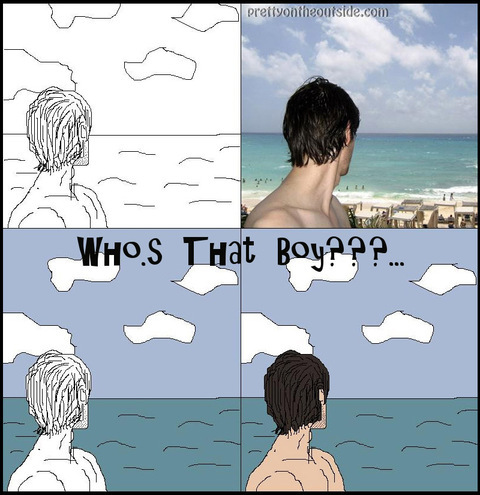 My reader Art from Mexico City kindly created this gift for me based one of my recently posted vacation photos. I've never had someone draw me and it's, well, very flattering. Blush blush. 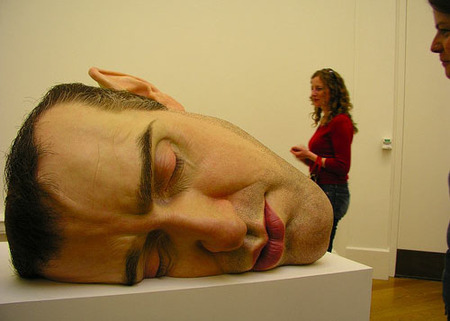 Behold the splendor of Ron Mueck's work. This brilliant artist's work is hopefully already familiar to you. 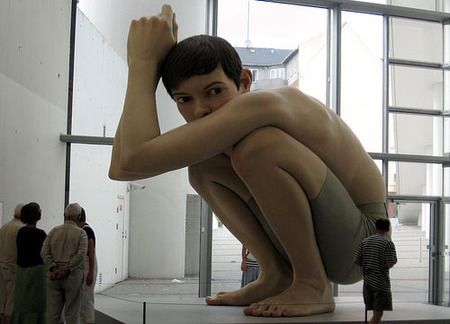 I am a huge fan of Ron Mueck's creations. The realism, scale, and detail mixed with the feeling you get when in the presence of one his creations is simply stunning. for such films as Labyrinth, a 1986 fantasy epic starring David Bowie. wall of a boutique and inquired as to the nice, pink stuff's nature. It might be hard to get it in my front door, but I'm willing to give it a try. Back in April of this year, when Project Runway season four was coming to a close, my reader Jenny sent me a pencil drawing that her 13 year daughter, Yumi, had done inspired by Chris's collection. Please click here to see that sketch and read about her love of the unusual and odd. I've got the biggest grin right now from rereading that posting and seeing Yumi's creativity in full force. 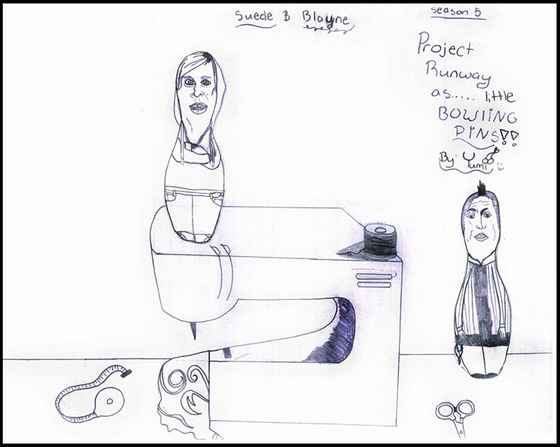 "I have attached Yumi’s sketch of Blayne and Suede as “Bowling Pins.” Yumi said the idea just randomly came to her. She thought a regular pose would be “too blah” for them and turning them into 4 inch bowling pins would be more exciting and fun." Too blah? Not even close. Exciting and fun? Yes and then some. A wonderfully imaginative depiction of Blayne and Suede? Yes, yes, yes!!!!! Thank you again Jenny for sharing Yumi's work. The way she has drawn these two is such a wonderful thinking outside of the norm depiction. Bowl pins--- why not? The attention to detail is great-- Blayne's hoodie, Suede's faux hawk, the scissors, measuring tape, and fabric-- it all works so well. Again, it was my complete pleasure to post this second drawing by Yumi. Definitely keep it Yumi, you've got tremendous talent! I love hearing from you all! I do. I appreciate your comments, requests, suggestions, and emails. Sure, they aren't always favorable but I take each and every message to heart. Lately, I've been receiving way more direct emails than I do comments, especially since I've returned from my trip to Mexico. One of my readers, Arthur who lives in Mexico City, wrote to thank me for my nice comments about the city he loves and calls home. As he told me, most tourists go to the lovely beach towns and typically skip his thriving city. As I've said before, I would encourage everyone who reads this blog to consider Mexico City for their next vacation. I flat out loved it. Arthur and I have exchanged several messages and he shared with me many photos from Mexico City and other places of interest around his country. It was great fun recognizing all the background places from his pictures. That beautiful creature he's holding is his love, Estella. Oh...... I have a weakness for pugs. My oldest sister has three and my brother has one. Their faces make my heart melt. Arthur sent me these other two shots of the lovely Estella around town. OK, how adorable is she? I say very adorable and love the composition here. This is a great one too. I think we are looking at Mexico's Next Top Pug Model or Miss Pug International. Seriously though, I love the colors, somber feel, and the dramatic lighting. Thanks Arthur for your photos and for letting me share them! Yesterday morning I received an email from a reader named Cathryn. I responded right away and that set off a great volley of messages. In one of the emails, she included a link to her husband's art website, and well, I was floored. This is an example of her husband Jason's work. It's titled Animism, is painted in oil on panel, and measures 15" x 45". Gorgeous! Please check out his website Hugger Studio to see more of his stunning work. 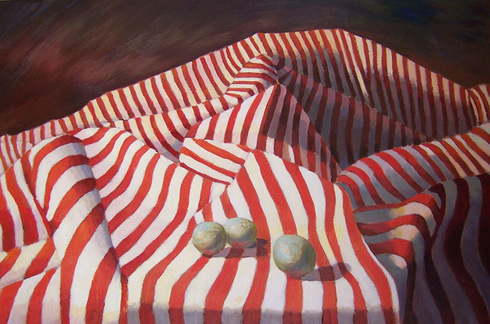 He creates still life/ landscape fusions that have a definite surreal quality. Cathryn sent this photo of a recently completed work. Get your checkbook and or Visa/ Mastercards ready. This is titled In The Shadow Of The Mountain, is painted with oil over acrylic, and measures 24" x 36". I stared at that photo for about ten minutes last night before showing it to my partner. He appropriately responded, "That's amazing!" 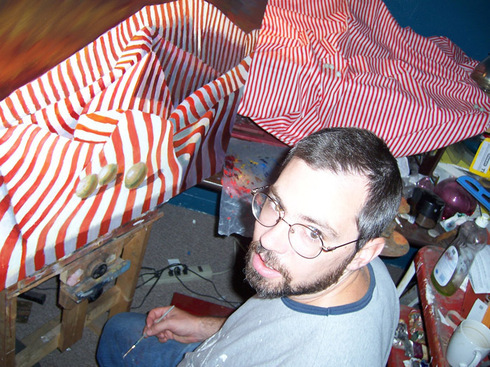 She also sent this great photo of John working on the painting. Talented? Yes. Handsome? Yes, yes. Passionate about what he does? Clearly. I could go and on about his work, but instead I'll shut up and give his quote from his bio page. 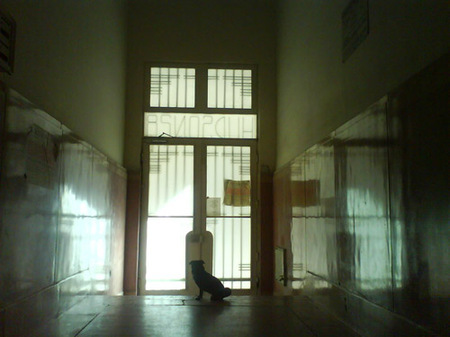 are ephemeral, inevitably changing with time." Again, make sure to check out John's website to see further paintings. 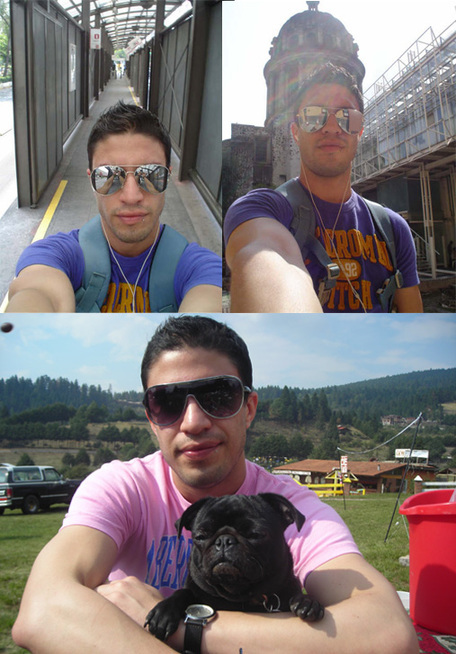 Thanks Arthur for your photos, messages, and recommendations. And thanks Cathryn for sharing John's incredible work. I am in complete awe of the work by artist BLU. BLU turns sides of buildings into imaginary spaces where people, critters, creatures, cities, cultures, technology, and consumerism all collide. I find his obsessive, doodle-like line quality to be pure magic. His blog has become my new favorite everyday read. Check it out and you too may get caught up in his fantastical world of thirty ft tall, bibbed rodents devouring logs with human feet. 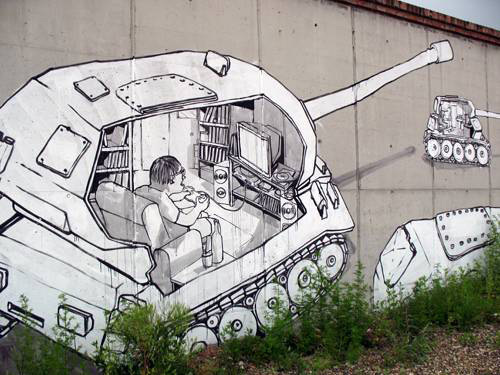 This video is of a mural he painted in Berlin a year ago. 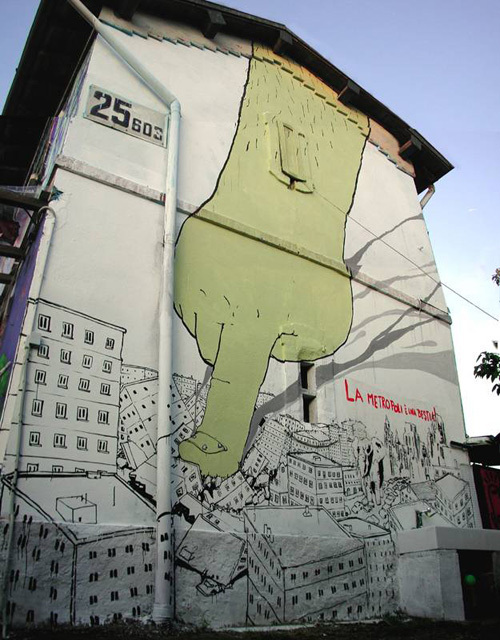 Also be sure to visit his website to see his sketchbook and other murals from around the world. Without question, Planet Hiltron is one of my absolute favorite sites. Its creator, Hiltron, makes some of the most insanely spectacular photoshopped images ever. If you're a frequenter of that site, as you should be, then you've noticed a bit of a lull in postings over the past couple months. Well I'm thrilled to see that little break is over and what Hiltron is offering now is just as imaginative and dazzling as the previous work. A character known as Gay Carrington has stepped up as the new muse. Gay is a former studio head from those bygone, black and white days of Hollywood. Miss Carrington is now poised to make a comeback and I am certainly cheering for her. There are many more clips on Planet Hiltron so be sure and check out all of them and subscribe to Gay's Channel. I give you Gay Carrington.